Is Laravel Application Development The Most Trending Thing Now? Laravel is an open source PHP framework which has been released in 2011. 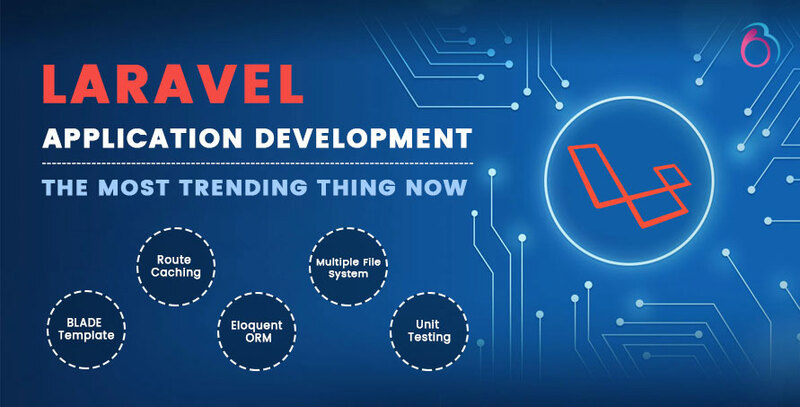 As per the survey, Laravel is the top most popular PHP framework for web development which has been recommended by most of the application developers for quick and easy web development. Many famous web development companies use LARAVEL for their web creation. It has values which are easy, simple and clear. Laracasts are the screencast tutorials available on its official site for better understanding of the framework. With its own template engine called “Blade?? ?, it eases our job. LARAVEL framework helps the web artists to develop the website or application in a quick and perfect way. Top five powerful features, launched in 2017, and have grabbed the attention of web developers all over the world. BLADE template: LARAVEL works on the basis of its own inbuilt template engines called “Blade??? which helps website developers to create an awesome layout in an effective manner. Unlike other famous PHP template engines, Blade does not limit developers from using basic PHP code in their views. Blade adds essentially zero overhead to your application. This template is simple but powerful to create an outstanding layout works. Route caching: Route caching accelerates the course enrolment of an application. This component is perfect for such advancement extends that have huge quantities of courses. However, once route caching is turned on, any modifications that you make to the application will never lead to effects. Route caching is generally considered as a part of the deploying procedure. Eloquent ORM: ORM stands for Object Relational Mapping. Laraval Framework includes ORM which has a simple PHP lively record application. This feature is used to issue data queries with PHP syntax rather than using SQL code by the web developers. Multiple file system support: Laravel 5 offers extraordinary support for various document frameworks which means multiple file system support to register different records. It gives an alternative to designers to utilize nearby or cloud-based capacity to give straightforward setup. In addition, developers can get storage options with ease. Unit Testing: Laravel framework facilitates Unit testing, which is capable of running many tests to guarantee that any change done by developers doesn’t affect any other web applications. It makes simple to compose unit-tests for its own particular code. The above-mentioned features make Laravel outstanding and highly recommended framework. Its uniqueness and simple access always make Laravel, the most popular framework among application developers. At BSEtec, we have a group of experienced, prepared and talented web designers who have firmly contributed to delivering exceptional custom web applications utilizing Laravel. In addition, we entirely employ Laravel framework for our recent products like ExpertPlus, AssetPlus, PixelPlus and JobPlus. Our products are well recognized and extremely commended by the customers as they are intended with layouts of Laravel. We can offer shape to your thought and plan the application as your business requirements. ExpertPlus: Want to explore your knowledge through online? Then click on our Product Expert plus by BSEtec, a portal for online teaching and creating courses. Expert Plus is a clone script; consequently, anyone can create their own built courses and manage them in ease of perfection. JobPlus: Bsetec has launched a new online job platform Job plus, truly stimulated for job seekers. Your knowledge and professional degree won’t get spoiled, as Bsetec allows you to find your dream job. Moreover, our online tutorial tools will help you to improve your functionality. PixelPlus: Bsetec has moved a step ahead to implement a tremendous clone script Pixel plus. The best way to merger technologies to exaggerate pictures, this has been put to use for commercial purposes. Our well-designed images can augment our business when it is designed with Bsetec product of Pixel Plus. AssetPlus: Want to transform your real-estate business into highly profitable one? Then Asset plus will help your dream to come true. Therefore, register your commercial website through our Asset plus clone script with affordable price.